The OGC Testbed 10 is a Testbed within the Interoperability Program. OGC Testbed 10 is a global, hands-on and collaborative prototyping activity designed for rapid development and delivery of Service-Oriented Architecture (SOA) components and services, as well as experience leading to documented best practices. The results of this program are initially documented as Engineering Reports and submitted to OGC’s Technical Committee for consideration as discussion papers, candidate specifications, and best practices. Upon formal adoption within the OGC Specification Program, standards and best practices are then made publicly available. Discussion papers may also be made publicly available, with the understanding that these do not represent a formal position of the OGC. The purpose of Annex B is to describe the detailed context and requirements for Testbed 10 development, which involves multiple interdependent activity threads. The requirements and architectures presented here are based upon a collaborative effort between OGC Testbed 10 Sponsors and OGC’s IP program and project management staff, called the IP Team. The OGC Testbed 10 architecture builds on the results from previous and ongoing OGC IP initiatives, existing OGC discussion papers and specifications, OGC Technical Committee activities, and publicly available documentation from related standards organizations including ISO, W3C, OASIS, and others. provides an overview of the OGC Testbed 10 development threads. discusses the architectural approach and technical baseline for OGC Testbed 10.
discusses the architectural approaches and issues for each of the OGC Testbed 10 development threads. The OGC public website provides a Glossary of Terms that may be useful to aid in understanding and interpretation of terms and abbreviations contained throughout this RFQ. Ontology: Creation of an ontology that renders shared vocabulary and taxonomy which models a domain with the definition of objects/concepts, as well as their properties and relations. Volunteer Geographic Information: The VGI effort continues on OWS-9 work to expand the use of OGC services and standards for VGI access, data linking, and rule-based conflation. Gazetteer: The Virtual Global Gazetteer effort extends the Single Point of Entry Global Gazetteer (SPEGG) work from OWS-9, building on the framework established in the earlier testbed and expanding gazetteer functionality to include gazetteer conflation and semantic gazetteer linking. WPS Conflation and Provenance: The WPS effort will advance data and service discovery. It will also investigate new and/or existing services the benefit of semantic mediation approaches to support discovery of pertinent services or data collections. Linked WPS and Decision Rules: This effort will develop a framework for WPS to investigate diverse data sets and build relational linkages and, when appropriate, invoke other services (e.g. WPS Conflation)..
Profiles: This effort will ensure that implementations developed in this thread are based on the latest versions of the DGIWG and NSG profiles of OGC Web Services. Hydro Model Interoperability: This effort will demonstrate interoperability among hydrographic and hydrologic data sources. Client applications are mobile. They can be found in enterprise desktop environments, workhorse tablets, or phone platforms. Information services are mobile. They are distributed across clouds, internal servers and even individual users. And they consist of raw data and just-in-time processing capabilities. With such an adaptive, open environment, security is a must. The Open Mobility thread of OGC Testbed 10 explores the geospatial standards requirements to implement these concepts. The Aviation Thread of OGC Testbed 10 seeks to develop and demonstrate the use of the Aeronautical Information Exchange Model (AIXM) and especially the Flight Information Exchange Model (FIXM) in an OGC Web Services environment. Advance interoperable management of aeronautical and flight information: Test, validate and demonstrate the use of FIXM, AIXM and Digital NOTAM in a service oriented architecture including Web Feature Service, Event Service, and CSW ebRIM Registry. Develop recommendations for exchange of terrain data: Assess and investigate suitable formats and approaches for the interoperable exchange of terrain data, and satisfying Aviation domain the requirements. Explore new sources of weather information: Assess, evaluate and test how the Web Gridded Document Service (WGDS) from NOAA’s National Weather Service (NWS) can be incorporated into the OGC – especially the OGC Aviation – architecture. Advance human factor based portrayal of Digital NOTAMs: Improve the way that aeronautical information, especially NOTAMs, is visualized. Advance compliance – Advance the capability to test the conformance of geometry types contained in AIXM datasets and improve the documentation of the WFS extension to handle dynamic feature data. Advance support of AIXM in development tools (J2EE, .NET): Investigate and test ways to improve AIXM software development. will be prepared in accordance with OGC published templates as defined on the OGC portal. Engineering Reports will be delivered by posting on the OGC Portal Pending Documents list when complete and the document has achieved a satisfactory level of consensus among interested participants, contributors and editors. Engineering Reports are the formal mechanism used to deliver results of the Interoperability Program to sponsors and to the OGC Specification Program Domain and Specification Working Groups for consideration. will be provided by methods suitable to its type and stated requirements. For example, services and components (ex. WFS) are delivered by deployment of the service or component for use in the testbed via an accessible URL. A Client software application or component may be used during the testbed to exercise services and components to test and demonstrate interoperability; however, it is most often not delivered as a license for follow-on usage. Implementations of services, clients and data instances will be developed and deployed in the Aviation thread for integration and interoperability testing, in support of the agreed-up thread scenario(s) and technical architecture. The services, clients and tools may be invoked for cross-thread scenarios in demonstration events. Note that certain draft deliverables will be required by the Interim Milestone at the date for use in cross-thread development. These early deliverables will be designated and handled on a thread-by-thread basis. The OGC Reference Model (ORM) provides an architecture framework for the ongoing work of the OGC. Further, the ORM provides a framework for the OGC Standards Baseline. The OGC Standards Baseline consists of the member-approved Implementation/Abstract Specifications as well as for a number of candidate specifications that are currently in progress. The ORM is a living document that is revised on a regular basis to continually and accurately reflect the ongoing work of the Consortium. We encourage respondents to this RFQ to learn and understand the concepts that are presented in the ORM. The structure of the ORM is based on the Reference Model for Open Distributed Processing (RM-ODP), also identified as ISO 10746. This is a multi-dimensional approach well suited to describing complex information systems. 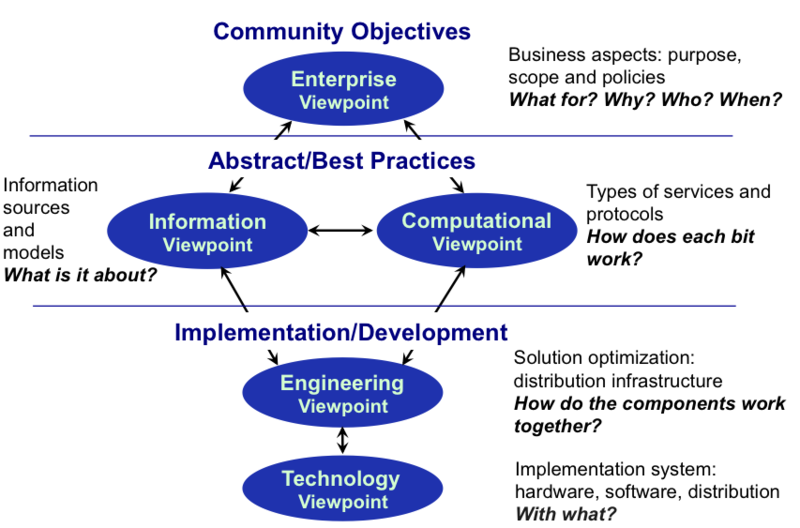 This Annex of the OGC Testbed 10 RFQ will use one or more of the upper four viewpoints of RM-ODP: Enterprise, Information, Computational, and Engineering, as shown in the figure below, for discussing the context for each activity thread in OGC Testbed 10. Each major section of the thread descriptions below identifies the relevant standards and other useful references, both normative and informative. The context of the description will make it clear whether a standard is normative (normally expressed as “will” or “shall” be used) or informative (“may” or “should”).